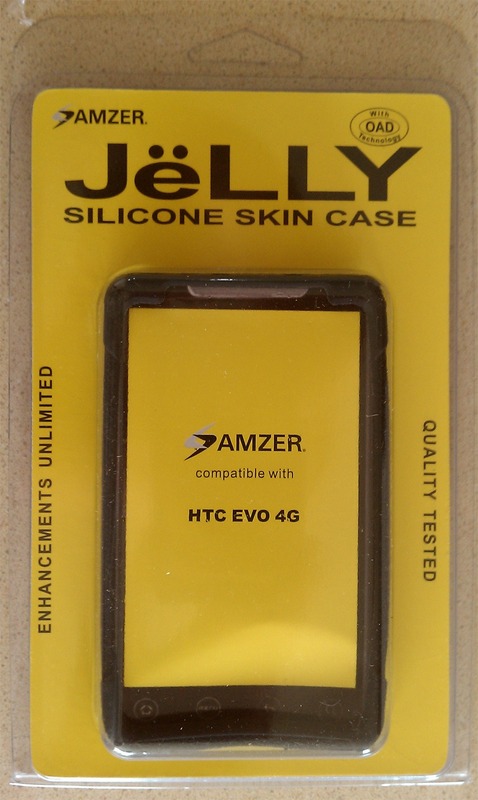 A few weeks ago, Amzer sent us some sample products to review for the EVO. They included two silicone cases (one red, one black), a Micro HDMI to HDMI cable, and 2 screen protectors (one mirror, one clear). Amzer is owned by Moftware, parent company of numerous smaller, more specific companies. The company isn’t some dinky accessory maker – they estimate that they sold 250,000 accessories for the EVO alone in the first two weeks after the phones release. Pretty impressive, if you ask me. 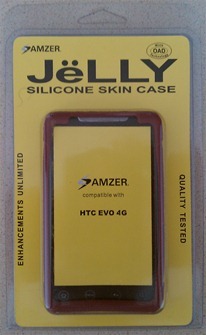 The cases they sent us were both the soft silicone skin cases they make (rather than the rubberized hard cases they also sell). They’re pretty similar to the cases you can find at BestBuy (for $30) or Sprint ($15), but at significantly lower cost ($10 on the Amzer site or Amazon). The CEO really believes what they’re selling is a quality product, and I’d have to agree – you’re basically getting a product of the same quality (as Sprint or Best Buy) for a fraction of the cost. This picture is small to hide the fact that it’s blurry. It’s a one-piece design, with a reinforced “X” across the back stretching to the corners. Most of the case is textured, though the buttons and reinforced parts are (surprisingly) smooth. It’s made with the company’s “Organic Anti-Dust (OAD) Technology” – which may sound like a marketing gimmick, but hell, it actually works. Will you get some pocket lint on the case? Yes, but I’d estimate you get about a fifth of the dust you’d see with a normal case. And when you do get some lint on it, you literally just wipe it off – the coating makes the case less sticky, as well. The only downside of the case – and this is going to happen with any case you buy, regardless of brand – is that it there’s no ventilation for the back of the phone. The EVO (and most smartphones, for that matter) generates a decent amount of heat between the battery and the CPU. When a battery is hot, it dies faster (the inverse is also true). 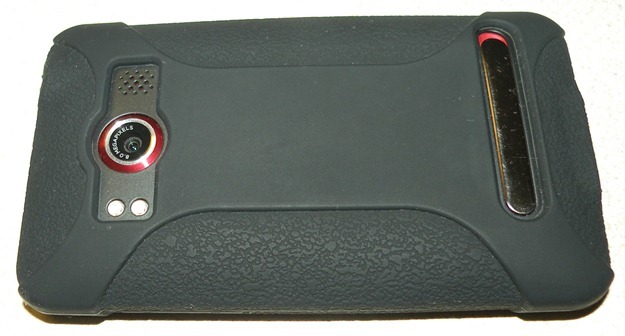 As a result, the battery life can be somewhat shortened when using a case. Personally, that’s something I can live with, given that it also protects my phone from scratches and minor falls – all in all, I think it’s a fair price to pay. Another thing I noticed after a few weeks of use was that the silicone softened up. It’s not like it’s falling off the phone, and I’m not worried about it at all – it just happened, and in the spirit of a complete review, I’m including it. To be honest: when I opened the box and saw this, I (sarcastically) thought “Classy.” I didn’t want to bite the hand that feeds though, so I decided I’d review it first (and the clear cover second), and I’d keep it on for 3 days to make sure I really gave it a chance to grow on me. As it turned out, I didn’t need that long – once it’s on the phone, it looks surprisingly better than you’d think. While my hands aren’t shaky like a smokers, they aren’t exactly surgeon’s hands either. As a result, I was pretty sure that I was going to ruin the only mirror screen protector they’d provided (I thought it would be both crooked and unbelievably bubbly, based on my history with these things). Surprisingly, though, it went on really well. I’ve got a few really, really minor bubbles (4, to be exact), but as you can (or rather, can’t) see in the pictures, they are so small that you can’t really tell they are there. It took just over five minutes, from opening the box to having the cover on and bubbles worked out – and that included stopping to take pictures a few times. As I said before, once I had it on I was actually pretty impressed by how it looked (and proud of myself, for that matter – it was straight). The “mirror” wasn’t tacky at all. 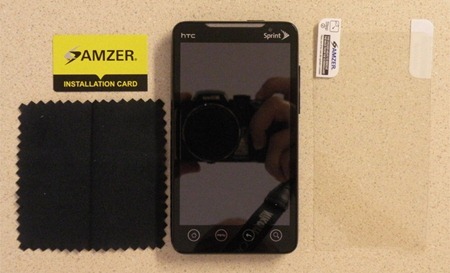 Looking at it, it reminds me of the LG Shine. 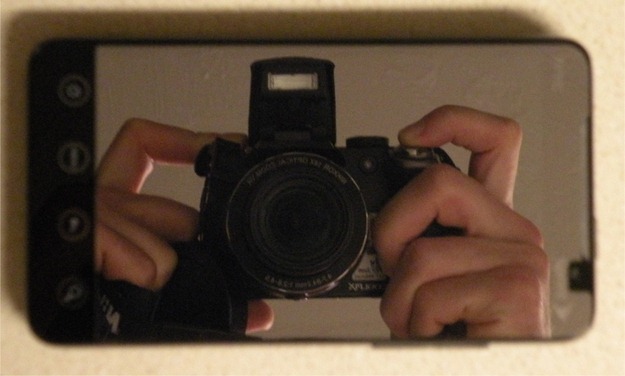 As you can tell from the pictures, this thing isn’t somewhat reflective – it really is a mirror. As a screen protector, this thing is solid. You notice when you’re putting it on that it’s very solid and pretty thick – there’s little flex to it. As a result, once it’s on your phone you feel pretty confident that your screen will remain unblemished no matter how hard you scratch the protector. I feel confident in saying that, although I didn’t actually test it (didn’t want to risk scratching my phone). The quality of the mirror protector is even more noticeable when you compare it to the clear protector – more on that below. I only have 2 complaints with the mirror screen protector: first, the screen needs to be a little brighter in order to compensate for the translucence of the cover when the screen is on. 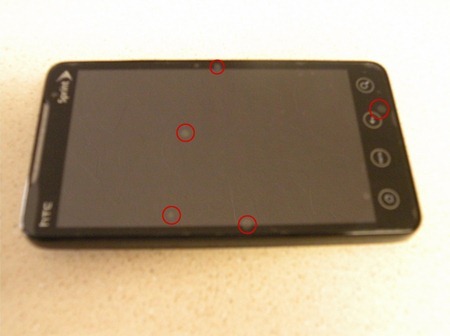 Since the protector covers the sensors, this will occur even when you’re using the Automatic Brightness setting. As a result, you can expect reduced battery life (then again, I had my brightness turned down below stock levels before, so your mileage may vary depending on your original settings). Second, the cover slightly distorts colors, producing a sort of rainbow effect. It’s almost like looking at one of those holographic pictured where as you move it, the image changes. It’s not significant, but it happens. Your eyes get used to it pretty quickly though, and after a few hours it becomes significantly less noticeable unless you consciously think about it. All in all, I was pleasantly surprised by the mirror cover. 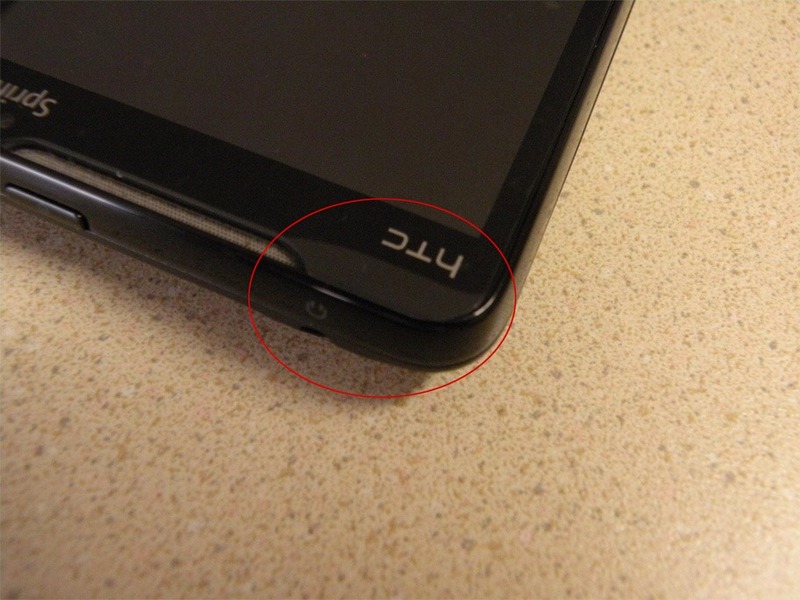 I’ll end the review of it with this: if you’re looking for a screen protector, don’t write it off easily. If you’ve seen and like the way the LG Shine looks, you’ll definitely like this. Not only that, but it feels bulletproof. I would rock this just because it’s very thick and durable. I tested the mirror protector first because I thought I wouldn’t like it (and thus I thought I’d want the clear protector for the long-run), but boy was I wrong. I’ve been using the clear protector for a few weeks now and it’s not nearly as durable as the mirror protector. By this I mean, it was much thinner and more flimsy, so applying it was more difficult (although I can live with that). Not only that, but it didn’t stick to the screen well at all. There’s a film covering both sides of the protector, to help apply it. 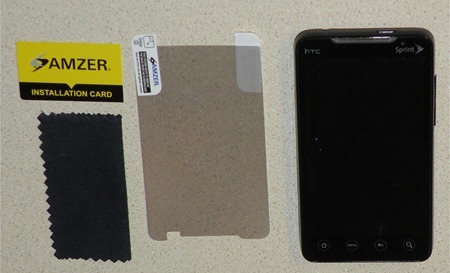 You remove the bottom film which covers the adhesive, then apply that side to the screen. 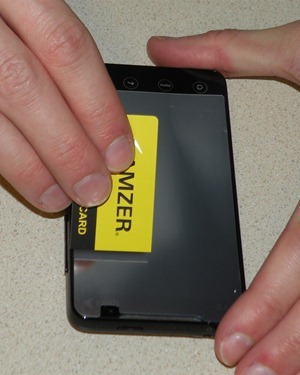 Once you have it applied, you remove the top film. 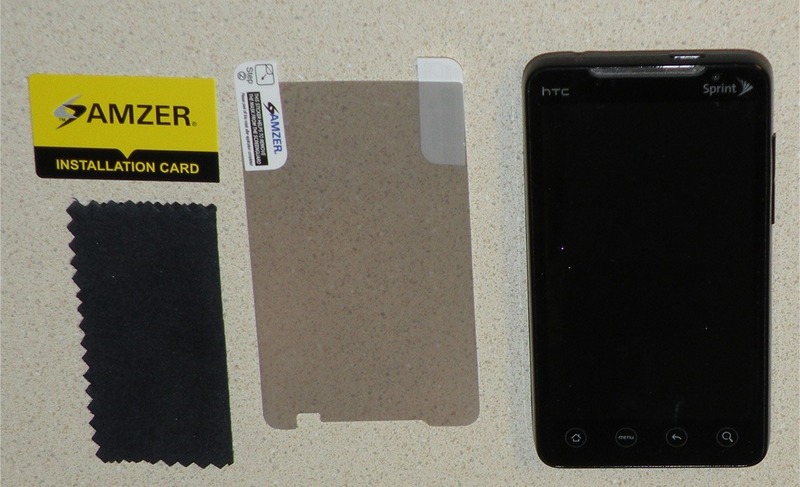 The adhesive was so weak on the screen side that when I removed the top film, the whole protector came off my phone. I reapplied, made sure I pressed it down firmly and removed most of the bubbles, then held the protector down as I removed the film, and it happened again. I ended up just taking the film off before reapplying a third time. Now, it doesn’t quite stick in one corner, and as mentioned above, there are holes and bubbles that I just can’t get out. Buzzkill. The verdict? 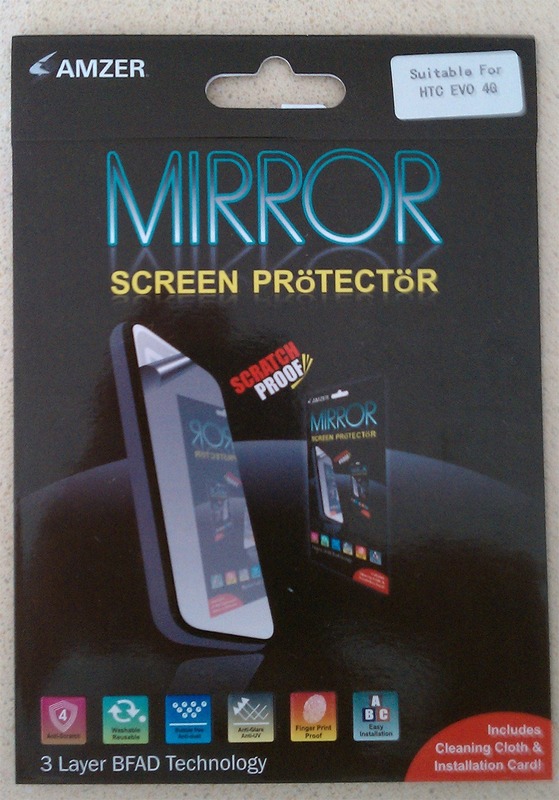 Go with the mirror screen protector. 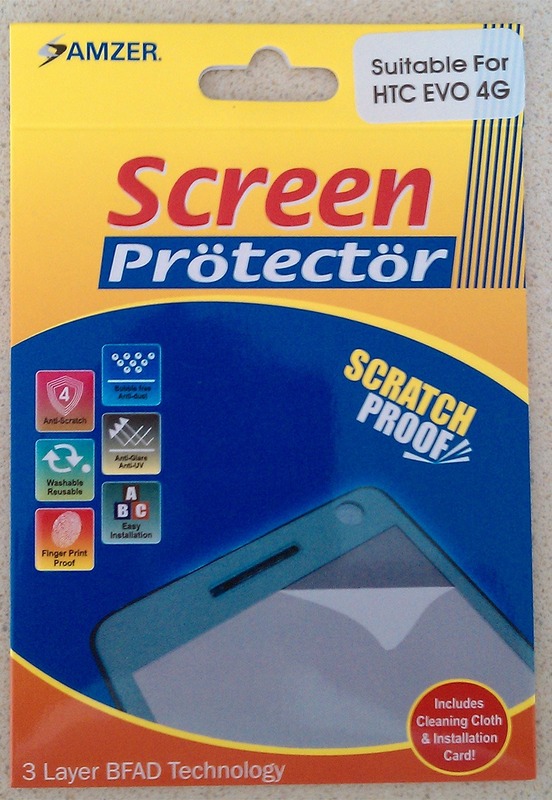 It is, without a doubt, the most durable screen protector I’ve ever used. 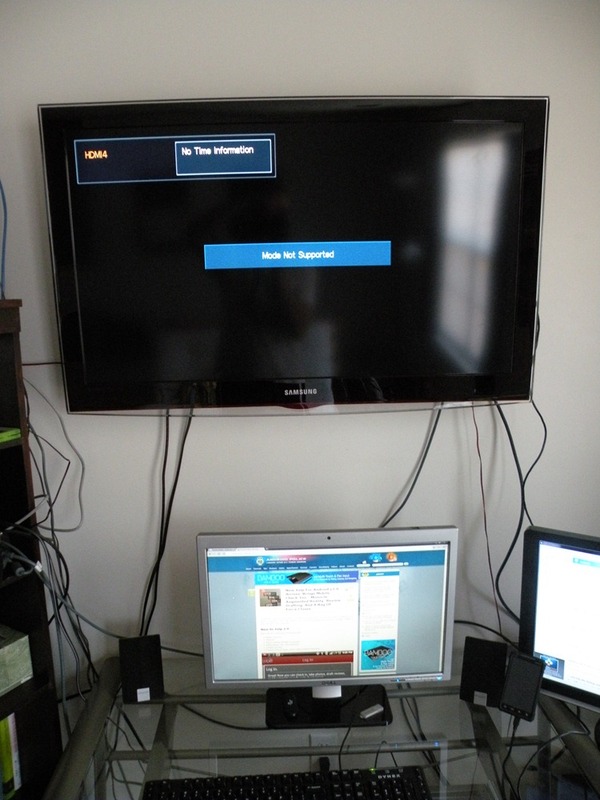 My TV can’t recognize the signal. This is in no way a reflection of the cable – it’s strictly an issue with my TV not being compatible with the signal from the EVO. Buzzkill. 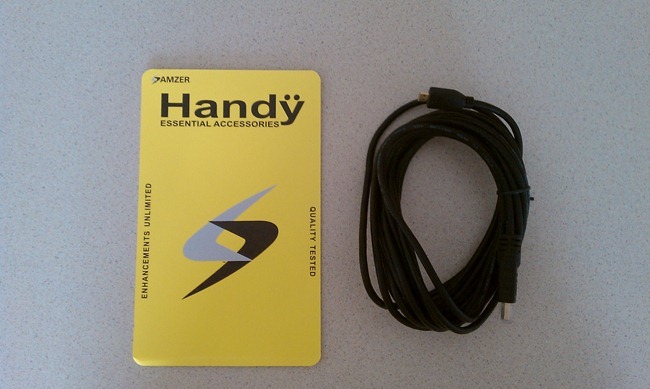 Granted, I haven’t actually been able to use the cable, but as a long-time electronics shopper and owner of HDMI cables, I’d say you’re probably going to be content with Amzer’s cable based on the tips and the thickness of the cable. All in all, Amzer’s products are an attractive deal. They’re priced in the budget range, certainly, but they generally deliver. Amzer is like the Toyota of the accessory world – good price and good quality, albeit not cream-of-the-crop. 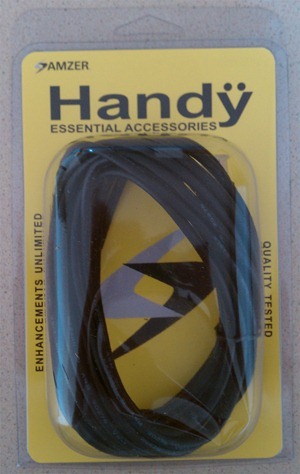 Personally, the case, protectors, and cable are all perfect for my needs and desires. I’m certainly happy overall with them, enough so that I’m going to keep using them (rather than replacing them with alternate products or brands.) 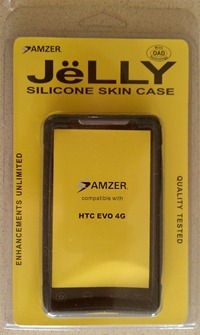 If you’re looking for reasonably priced protectors and cases, you won’t be disappointed if you choose Amzer’s products. Finally, a big thanks to Amzer for sending us these products for review.